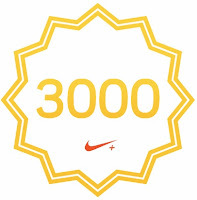 Richard's Page: Warm Enougn to Ride and 3000 miles on Nike+! I was thinking that I would go for a ride this last weekend but didn't and this morning, it was down in the low teens again and the afternoon temperatures are no longer getting above freezing. So I drove the truck in this morning since I had an errand to run. Yesterday, I got in quite a bit of walking but felt really chilled by the time evening came. We are still getting quite a bit of warmth from the sun these days as you can really feel the temperature drop once it sets. No pictures as it is really gray and drab with all of the leave gone and no snow. 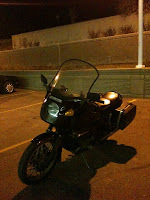 Tonight, I will drain the gas from the bike and push it back to it's place in the back of the garage 'til spring. There are a number of maintenance tasks needed as well as some minor repairs. I am still debating whether I should pull the heads to check for valve recession since it would be really inconvenient to break down in the middle of a trip. I believe, from articles on the Internet, that my bike is one of those that has a problem with valve seat metallurgy. I haven't found any records that indicate that this issue was taken care of by the previous owners. Plus, the mileage is about right for the problem to show up (60K miles). Friday Afternoon - After running around at lunch time, I noticed that I was only 1¼ miles from the 3000 mile mark. I needed to drop off a form at Signers' Hall on lower campus so that seemed like a good excuse to get a few more miles in. So I reached one of my goals and it isn't even December yet. Congrats on reaching your goal--ahead of time, no less. Nice blog. Looking forward to reading the other posts!